From the very beginning, I had faith in James Wan. I loved the original Saw, and Dead Silence wasn’t too bad either. He’s a young film maker with a ton of talent and a lot to offer, and Wan put it all on the table with his newest film; Insidious. I’ll start with the film’s soundtrack. Joseph Bishara is known for his work on the soundtracks of Night of the Demons (2009) and Repo! The Genetic Opera and I can say, in full confidence, that this is definitely his best. The strange, ominous, unsettling noises and music that Mr. Bishara brought to the film were incredible, and really set the mood for the dream-like horror movie. The next part of the film worth mentioning is the cinematography. David M. Brewer and John R. Leonetti used the camera to even further add to the creepy atmosphere of the movie. Cinematography is something that’s often overlooked with horror films. Most movies contain the simple close-ups, shaky running cameras and static angles. Insidious is different. It combines first person shots, suspenseful moving angles, incredible use of focus/out-of-focus shots, and a ton of other creative tricks that really brought the film to life. The third and probably most important part of the film that really blew me away was Leigh Whannell’s incredible story. Unlike most paranormal horror films, Insidious wasn’t the generic haunted house story with a nice little family in their nice little home that is also inhabited by some generic evil force that leaves you thinking “Why didn’t they just move out of the house?” No, Insidious takes it a step further by saying that it’s actually the son that’s haunted. Alright, not too bad but that seems like it’s been done before as well, and that’s where Insidious really succeeds. It goes way beyond the story about a little boy with some nasty spirits following him around. I won’t ruin it for those of you who still haven’t seen it, but trust me; the trailer doesn’t even explain half of it. Overall, Insidious was incredible. Not only because of how much I enjoyed it, but because of how it managed to actually be scary in a genre that’s become a bit jaded in the actual real scare department (this does not include shock or jump scares), especially to a veteran fan like myself. So, if you’re a real horror fan, go see Insidious as soon as possible, I promise it won’t disappoint. 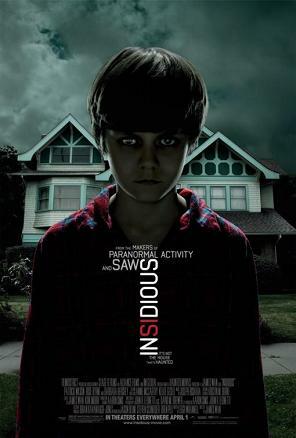 “Insidious” begins with an old woman lurking in a house corridor while a young boy named Dalton is sleeping in his room. Renai and Josh Lambert (Rose Byrne and Patrick Wilson) have recently moved into a new house with their three children. One morning, Renai begins looking through a family photo album with her son, Dalton (Ty Simpkins). He asks why there are no pictures of Josh when he was a child. Renai reasons that he has always been camera shy. Dalton tells Renai he is scared of his new room. One day, Dalton hears something in the attic. When he goes to investigate he sees something off screen that scares him and takes a fall when the attic ladder breaks. The next day Josh goes to wake Dalton, but he does not move. They rush him to the hospital where the doctors say he is in an unexplained coma. Three months later Dalton is moved home, still in the coma. Disturbing events begin to occur. Renai believes the house is haunted when she begins to see and hear people in the house. She confronts Josh about the events and the family soon moves to another house. In the new house, increasingly violent and supernatural events begin to happen again. Josh’s mother, Lorraine (Barbara Hershey), contacts a friend, Elise Reiner (Lin Shaye), who deals with paranormal activities. The family, Elise, and her team go into Dalton’s room. There, she sees and describes a figure to one of her two assistants, who draws a black figure with a red face and dark hollow eyes. Blah, blah, blah. I’ve said it once and I’ll say it again…PG-13 horror movies are dull, boring, and predictable (“Drag Me to Hell” is the sole highlight from the last decade of PG-13 horror). Poor Lin Shaye and Rose Byrne, they deserve much better material than what they are given to work with here. “Insidious” offers no thrills, has inane plotting, and the final twist ending is so preposterous that it has to be seen to be believed. Don’t, however, watch this movie based on that last remark. You’ll be sorry later.